We are most grateful to the Government of Viet Nam, and the Da Nang Province, for hosting this first ever Pangolin Range States workshop, to the Government of the U.S for co-hosting, and the U.S. Fish & Wildlife service for the generous financial support. I would also like to recognize the support that has come from many non-government organizations, and the individual experts who are so generously giving this workshop the benefit of their time and expertise. We are delighted to lend our strong support to this event, which is dedicated to a lesser known but nonetheless extraordinary species that deserves to be in the spotlight. CITES is the preeminent global legal instrument for regulating international trade in wildlife, including pangolins (Manis spp), and all 8 species of pangolin have been included in Appendix II of CITES since 1975. Four of the species occur in Africa, and four in Asia – and in 2000 the Appendix II listing of the four Asian pangolin species was amended to state, and I quote: “zero export quotas for specimens removed from the wild and traded for primarily commercial purposes”. There is no such annotation for the four African species. As such, international trade in wild specimens of these species can take place subject to meeting CITES strict regulatory requirements to ensure that any such trade is legal, sustainable and traceable. The troubling reality is, however, that all wild pangolin populations are now declining, and all 8 species are threatened to various degrees. The threats come from habitat degradation, over-exploitation for trade in their scales and meat, and illegal trade that appears to be occurring at an industrial scale. In light of these threats, at the 16th meeting of the Conference of the Parties to CITES held in Bangkok in 2013 all range States of the four Asian pangolin species were requested to compile information on the conservation of, and illegal trade in, Asian pangolins and of their efforts to address such trade. This information was reported to the CITES Standing Committee at its 65th meeting in 2014 at which the Secretariat observed that the illegal trade in pangolin specimens was escalating at an alarming rate. The Standing Committee subsequently decided to establish an inter-sessional working group, which pays serious attention to the threats posed to both Asian and African pangolins. how to prevent unsustainable trade in African pangolins and to combat the illegal trade from within and between both Asia and Africa. The participants gathered in Da Nang today come from across all African and Asian range States. Together with the participating experts, from both within and outside of government, we have the best qualified people on the planet assembled in one place for three days to help us arrive at solutions to these challenges, and I do hope you make best use of this unique opportunity. I would dearly have loved to join you for this historic meeting, and to enjoy the warm and generous hospitality of our host government, Viet Nam, but it has not been possible. We are however very well represented by our good colleague, Pia Jonsson, the CITES Enforcement Support Officer. Let me close by again expressing our deep gratitude to the Governments of Viet Nam and the U.S., and all participating NGOs and experts, for giving pangolins the attention and the profile that they deserve and we all eagerly await your conclusions and recommendations. U.S. 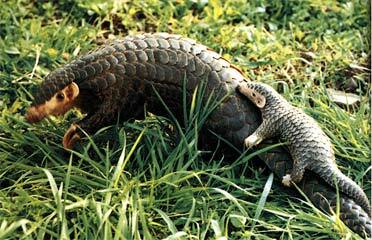 Fish and Wildlife services pangolin species page. Annex 4: Analysis of seizure data for Manis spp.